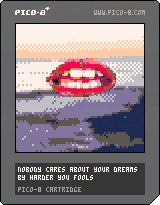 It’s Nobody Cares About Your Dreams! I knew I wanted my first cart to be something… unusual, and this song was in my head constantly when I started doing the Pico-8 stuff. The video features lots of repeated elements so it felt like it might just be feasible. I’m also interested in getting the Pico-8 to do things it’s clearly not designed for - like big, digitised graphics sourced from video - so this cart ticked that box as well. Everything’s running off a simple cue system where the cart counts the number of frames since the start and things trigger at pre-set frames. Not fancy, but it works. It turned out pretty well, I guess? Everything looks better than I imagined, apart from the beach background which suffers from being a static image. On the other than, the subtitled lyrics don’t work nearly as well as I expected. In hindsight Matt Lees’ vocal track is a huge part of what makes the original video work. Here’s the spritesheet - you can see the beach scene is a 64x64 square blown up double size to fill the screen (extra chunky pixels!). The big pudgy font was added at the last minute when I realized the cart needed something oomphy to finish on, and I had just enough space left to fit all the letters I needed. There’s more video conversions on my worklist! Including one which I’ll be super pleased with if I manage to make it work. But for now, on to cart number 2!